Both the JV and Varsity Boys Hockey teams got their respective seasons off to flying starts this past week with excitement all around, including an overtime thriller from the JV and a hat trick from a leading senior to open the season for the Varsity. On Oct. 22, the JV got things started on the right foot defeating Westchester Hebrew HS, 4-0. The offense set the tone early, carrying the majority of play deep in the Westchester zone and peppering their goalie with many shots. The team was led by the timely scoring and passing of Joseph Habert (2 goals, 1 assist) and Netanel Nemet (1 goal, 1 assist). Sam Beyda also got in on the scoring with an assist from the stick of Ralph Kraiem. Defensively, the Flatbush goalkeeping proved to be as sturdy as a stone wall, with Moshe Illouz and Aaron Kubie combining on the shut-out, blanking the Wolves on the evening. The JV followed up this strong performance with an exciting match with cross-town rival Magen David that needed overtime to decide on a winner. In front of a rowdy, balcony-filled crowd, Netanel Nemet slammed home the ball during the 5-minute 3-on-3 overtime session on a quick feed from Allan Bailey, causing the home bench to erupt and spill out onto the floor in excitement! In the team’s third game of the season, the JV drew a 1-1 tie with HANC. Joseph Habert scored the lone goal for the Falcons with an assist from Ralph Kraiem. The team was unable to capitalize on a number of scoring chances in the overtime period. Not to be outdone, the Varsity continued the winning ways, putting up 4 goals against the Magen David Varsity and starting the season off with a convincing win over the rival Warriors. After yielding a soft goal to Magen David less than 3 minutes into the contest, the Falcons answered with 4 goals of their own the rest of the way. Chalk it up to early nerves, but after letting the first goal of the game squeak by, Senior goalie Stephen Esses tightened up the crease, and let nothing past him the rest of the way. Flatbush got on the board with a sharp shot from the stick of rookie Sam Laniado, putting home the first goal of the season and the first goal of his career (the first of what should be many to come over the next 4 years). Flatbush took the lead less than a minute later on a beauty of an exchange from Morris Bijou to Moe Maleh, and never looked back. Maleh would score two more times (off feeds from Marc Barsano and Sol Sasson) to record his first hat trick of the new season. The varsity kept the energy from the game flowing in its second contest behind the shut-out goaltending of Stephen Esses and the continued brilliance of Morris Bijou and Moe Maleh (one goal each) as well as the pin-point passing of Stevie Hafif (2 assists) to blank the Hurricanes of HANC 3-0. The third goal was tallied by Sam Laniado, his second of the season in as many games. Nest Notes: The Varsity Basketball team suffered its first defeat of the season on 10/28, falling on the road to Rambam 3-1. The Varsity are back in action on Thursday, 10/31 at new league opponent YDE. The JV return to action on Sunday, 11/3 in a re-match with HANC on Long Island. On October 23rd, 2013 students had an opportunity to cook for less fortunate families in a program known as "Cooking for a Cause." Each week the students cook something different and the food is donated to a Chesed organization. This week the students made vegetable, chicken and matzo ball soup. For dessert, they made delicious chocolate babka. Thank you to master chef, Mrs. Rochelle Dweck for leading the event and sponsoring the ingredients with Mrs. Cookie Fishel. All participants had an amazing fun Chesed experience!! 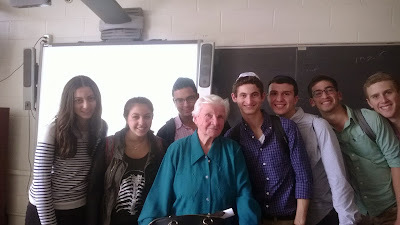 Several Senior and Junior classes were privileged to meet and speak with Mrs. Czezvana Zaks, an 86- year old Polish Catholic woman who has been recognized as one of the חסידי אומות העולם by Yad Vashem and the Simon Wiesenthal Center. Mrs. Wielgus, Jewish History chairperson, arranged for Mrs. Zaks to visit the Yeshivah. During the Holocaust, Mrs. Zaks' family sheltered 14 Jews who hid for nearly two years in their apartment. Students first watched a riveting subtitled video in which Mrs. Zaks described how and why her family succeeded in hiding these Jews and the dangers they faced in doing so. At one point, the Jews' hideout was nearly discovered, but Mrs. Zaks, then a teenager of 16, managed to send away those searching for them. Students then had a question and answer session with Mrs Zaks. Katarzyna Kulinska, an educator from the new Jewish Museum in Warsaw, served as Mrs. Zaks' interpreter. 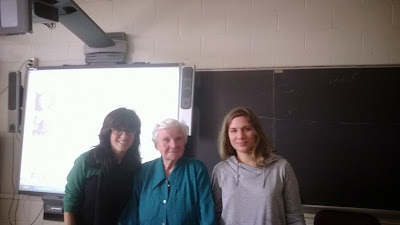 The sessions with Mrs. Zaks were moving and inspiring. 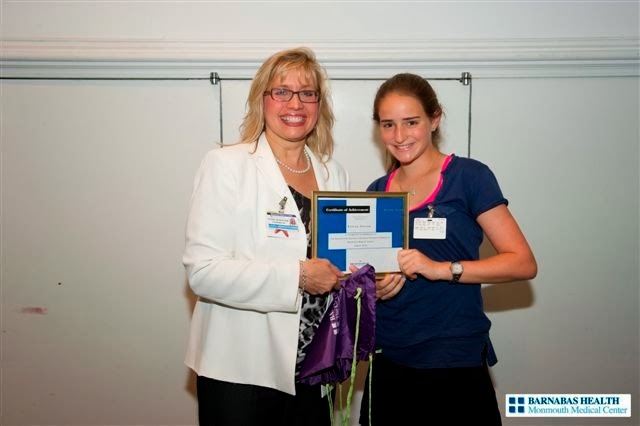 In senior Joy Feinberg's words, "We felt honored and privileged to meet you and we know the world is a better place because of brave people like you." Mrs. Wielgus's Sephardic Jewish History elective class took a trip to experience two different types of Sephardic communities in New York City. Senior Sarah Cohen wrote the following about the trip. Walking into the synagogue was like walking into what I imagined the Bet Hamikdash to look like. 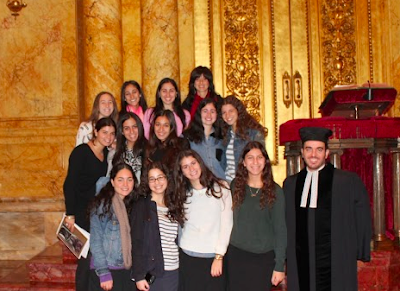 Rabbi Dr. Abadie showed us around and shared with us how the architecture was thought out very carefully. For example, the trees outside, by the entrance of the congregation, represent the Tree of Life and also represent Edmond Safra himself. Just like the tree of life helps people and is always alive, Edmond Safra helped his community and his name is still living today. Walking up the stairs to the second floor was like walking into the Kotel; it actually was the western wall of the congregation. After our tour, Rabbi Abadie explained that the reason why there was so much money put into the congregation was because they believed it will come to Israel with them when Mashiach comes. No need to fear leaving it behind. Right when he said that, I closed my eyes and imagined myself sitting there in Jerusalem in the times of Mashiach. Walking into this synagogue was like entering a time machine and getting sent back to the western European life in the mid 1600's. Sounds crazy, but that's really what it felt like. This synagogue was built in 1897; however, it is the 4th location of the congregation. It's actually the oldest congregation in North America; it started in 1654 when Jews ran away from Brazil. Rabbi Ricky Hidary showed us around the synagogue and explained the set up. What interested me most was that there were gas lamps because electricity was first invented in the 1800's. This was part of the reason why I felt like I was in a time machine. Gas lamps? Who uses those these days? Another thing that caught my eye was the Havdalah candle and cup that were hidden under one of the gas lamps. The reason they are there is to remember the lives of the Marranos and how they had to practice Judaism secretly. Rabbi Hidary in the traditional garb, sang us some tunes, which some believe are the same tunes as the ones sung in the Bet Hamikdash. These tunes sounded very similar to the ones Sephardic Jews sing today! I was amazed by how similar today's Jewish life is to Jewish life back in the 1600's. Students and Faculty all wearing pink for Pink Day 2013! October is National Breast Cancer Awareness month. Every year the Tzedakah Commission thinks of different ways to spread breast cancer awareness. Throughout the month of October, members of the Tzedakah Commission sold pink bracelets engraved with the words "Courage" and "Strength". Victor Zeitounie, a member of the Tzedakah Commission also arranged for the donation of breast cancer awareness accessories to sell. All the money raised was donated to the ICRF, Israeli Cancer Research Foundation in memory of Mrs. Suzanne Blaine A"H . The Tzedakah Commission hosted their annual "Pink Day" on October 17, in which everyone was asked to wear pink to show support for breast cancer awareness. With pink shirts, ties, scarves, sweaters etc., faculty and students made the day a big success. 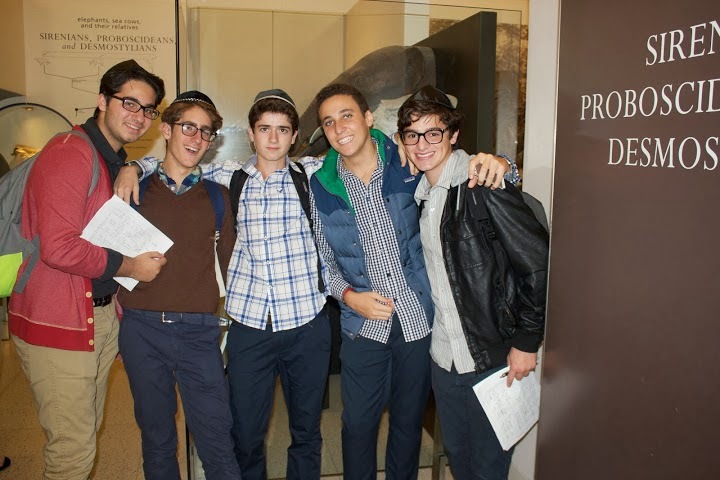 The AP Biology classes, accompanied by their teachers Rabbi Lubner and Dr. Fruchter, visited the Hall of Human Origins and Giants of the Deep Whale exhibits at the American Museum of Natural History on Tuesday, October 15th. The purpose of the trip was to observe anatomical differences between related organisms. Students were able to study the differences between ancient and modern whales by comparing their ankle bones, forelimbs, and heads among other parameters. This morphological evidence coupled with biochemical evidence (a protein) they used in a computer lab using ClustalX and Phylowin gave them a much richer understanding of how we study groups of organisms to see their evolutionary relationships. Student understanding of human origins was enhanced by comparing skeletons of related primates: chimpanzee, modern human, and Neanderthal; DNA evidence; and then by studying "Our Family Tree": Hominids. The students ate lunch at the museum when they arrived and prayed mincha before they left. 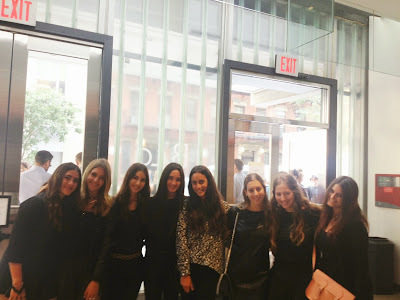 They had a wonderful time and their exemplary behavior brought credit to the Yeshivah. 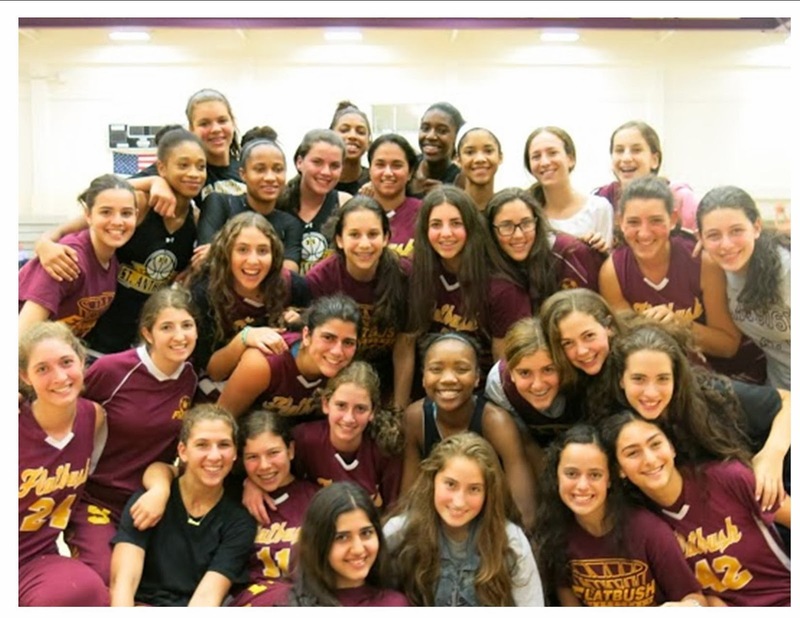 This past week, Yeshivah of Flatbush basketball opened the 2013-14 campaign with pre-season scrimmages for both the boys and girls teams, as well as games for the Boys Varsity in the Magen David Pre-Season Tournament. Last Sunday, the boys teams travelled to Elizabeth, NJ to take on JEC. This would be the first opportunity for our boys to take the court under the guidance of new Head Coach Avi Borenstein. Ironically, Coach Borenstein got his start in the MYHSAL coaching JEC! Playing an up-tempo style and insuring all team members got time on the court, the JV played a tough game, losing a heart-breaker in overtime after JEC tied the game in regulation with a 3-pointer at the buzzer. The Varsity then took the court, and the heavily senior-laden team set a scorching pace, pressuring the ball all over the court. Utilizing the entire roster, the Falcons took a double-digit lead into the half and worked on the new offense and defense through the remainder of the game. The next day, the Varsity faced its first challenge of the season facing off with YDE in the opening round of the Magen David Tournament. Again, utilizing the strength of a deep bench, the team opened up a 20-point lead in the first half and used the second half to explore a variety of player rotations in closing out the game. The Falcon’s tournament run came to an end two days later, falling in a hard-fought battle to an SAR team that pulled away in the final 5 minutes of a game that watched Flatbush again sprint out to an early lead, then settle into a back-and-forth that saw the lead dissipate in the second half. Nevertheless, the pre-season has served to demonstrate that the Falcons will be a team to be reckoned with – both the Varsity and the JV – throughout the season. For the first time in recent memory, the Flatbush girls’ basketball team took to the court against a non-Yeshiva League opponent. Our girls travelled to Westbury, Long Island to take on the Westbury Yes-We-Can Community Center Basketball Club. The club is made up of high school students in the North Hempstead area who come together after school for after-school activities and camaraderie, part of which includes playing on the Center’s club teams. The girls will start their regular season with a Double-Header on October 30 at Kushner in Livingston, NJ. Their first home game will be in the Falcons’ Nest on November 13 against HAFTR. The boys JV will open the regular season on October 23 at Yeshiva Shaare Torah. The Boys Varsity will open up at Rambam on October 29, before taking off for Memphis, TN two days later to represent Flatbush at the Cooper Yeshiva Basketball Tournament. The JV boys first opportunity to defend the home court comes on November 6 against Lev Bonim; the Varsity welcomes a powerful Heschel squad on November 14 to kick off the home season. On October 9th, the Yeshivah of Flatbush held its first Yachad event of the year. 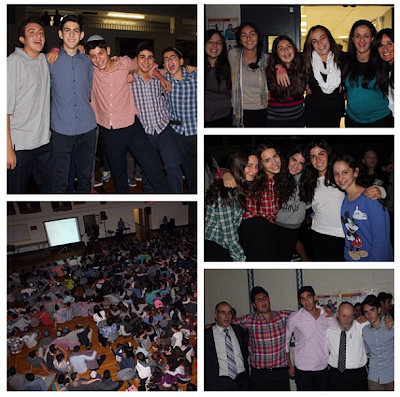 Students from Yeshivah of Flatbush enjoyed a great night together with people with physical and mental challenges. The program began with games in the auditorium, followed by a slideshow and videos to get the special guests excited for what was to follow. Everyone was invited to the gym for pizza and soda in the gym where the dance party began. The students formed circles with the Yachad members; smiles and good feelings filled the room. 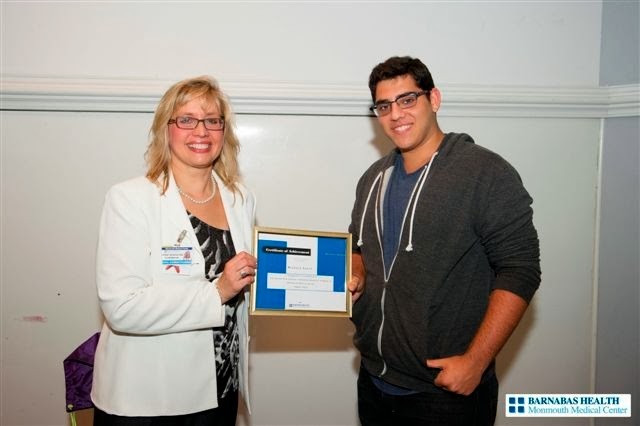 It was an amazing chesed event. On Wednesday, Oct. 8, Yeshivah of Flatbush held a memorial service for Hacham Ovadia Yosef z"l, one of the greatest poskei Halacha and spiritual leaders of our times. His accomplishments include serving as the Sephardic Chief Rabbi of Israel for 10 years, forming the Shas political party, and writing numerous books about Halacha. Hacham Yosef had influence on many recent issues such as the remarriage of women whose husbands went missing in war, the permissibility of selling land to non Jews during shemitah, and the Palestinian conflict. As Rabbi Levy mentioned, whether you realize it or not, many of out traditions today come from the psak of Rav Ovadia Yosef. Rabbi Avi Harari spoke about Rabbi Yosef's dedication to Torah and commitment to protecting the interests of Sephardic Jews and shared personal stories. While he was in Israel, Rabbi Harari (and his cab driver) would often attend Rabbi Yosef's classes, which dealt with practical issues of Halacha with great insight and intellect. His classes, broadcasted on TV and posted on YouTube on Saturday nights, were popular with all types of Jews throughout Israel. Rabbi BenLulu put together a video of the funeral service in Israel, which over 800,000 people attended, the largest gathering of Jews in Jerusalem since the time of the second Bet Hamikdash. The love people had for Rabbi Yosef and the grief felt from losing him was palpable in the faces and sobbing of the funeral goers. "We are like orphans without a father!" one bereaved mourner cried out. In losing him, "the Jewish people have lost one of the wisest men of this generation,” said Prime Minister Benjamin Netanyahu on Monday. The Spiritual Growth Commision has set up a program in which students and teachers can learn Mishnayot in honor of Hacham Ovadia. See http://seniors14.com/mishnayot/# to sign up to learn a perek. Thank you to them and to everyone who put together the program on such short notice. May Hashem send nechama to the Yosef family and to all of Am Yisrael. 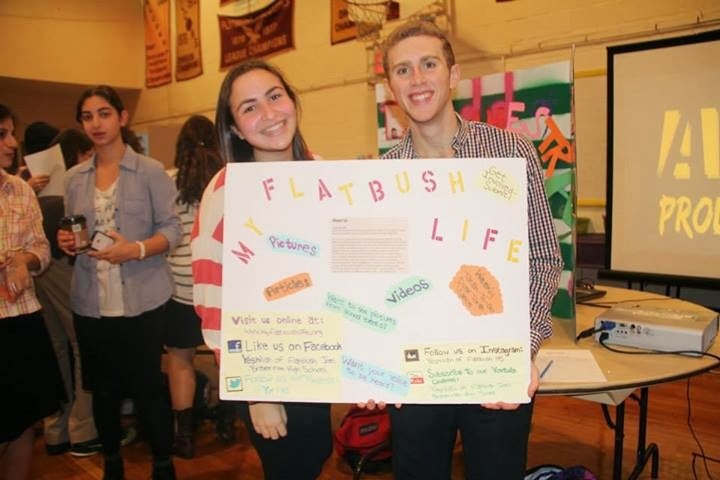 On October 15th, 2013 the Yeshivah of Flatbush held its fifth annual Commission Fair to introduce students to the many different commissions, clubs, and teams available to students at Flatbush and to encourage them to sign up for those that interest them. Some of the commissions featured were Chesed Commission, Eko Commission, Cooking for a Cause, Choices Commission, Tzedakah Commission, Mock Trial, Partners in Reading and many others. It was an exhilarating experience for all of the students. From a freshman's point of view, the fair was "pretty much exactly what I expected, in the good way; I can't wait to get involved!" Overall, the program was a success thanks to SGO 2014 and Rashelle Gersh, fair commissioner. Rosh Chodesh is a time when Jews celebrate the beginning of the new month. On Friday October 4, Rosh Chodesh Cheshvan, students and faculty of the Yeshivah of Flatbush gathered in the gym for a special Kumzitz, led by Rabbi Naftali Besser, Dean of Students. The inspiring program included videos of students making a difference through chesed actitivies and many meaningful songs and tefillot sung by everyone with the one-of-a-kind Flatbush ruach and ahavat Yisrael. Last evening, Yeshivah of Flatbush High School launched a new program designed to teach our girls how to make Challah and the great mitzvah that it entails. Fifty of our young female students stayed late Thursday night from 5:30pm to 7:30pm to help make ten pounds of challah for those in need. All challah will be donated to SBH and delivered fresh Friday, Erev Shabbat. This beautiful program would not have been made possible without the generous donation of a Bosche challah maker by Cookie, David, and Katie Fishel. We thank all the girls who made this beautiful mitzvah possible and hope to continue this amazing program in future weeks. Tizku Lemitzvot! On Monday, October 7th, the senior grade visited the National 9/11 Memorial. The program started before we even went to the memorial. On the Thursday before, the seniors watched a powerful video about 9/11 and listen to a meaningful speech from Rabbi Rosenblum about his personal connection to that day. We were also each given the name of someone who died during the terrorist attack to search a little bit about them ahead of time. At the memorial, we split up into groups with faculty members where we discussed what happened on September 11, 2001 and everybody shared about the person they researched. We then had the opportunity to find the name of our person on the panels and trace the name onto paper to memorialize the person. The memorial was an extremely unique place because so much thought was put into every detail. We saw the two pools where the Twin Towers used to be and listened to water crashing down by the fountains. In the middle of the fountain, the water flowed into an opening that seemed endless because you could not see what was at the bottom. When we got back to school, each class had a session with a faculty member who came to the memorial. We spoke about what it means to memorialize something and how we were affected by the experience. We also discussed what it meant to be an American as well as a Jew living in America. We ended the conversation with suggestions on how we could give back to our local communities. It was obvious by the overall mood back in school that all the seniors were truly impacted by the visit and gained a lot from it. We will remember this meaningful experience for the rest of our lives. 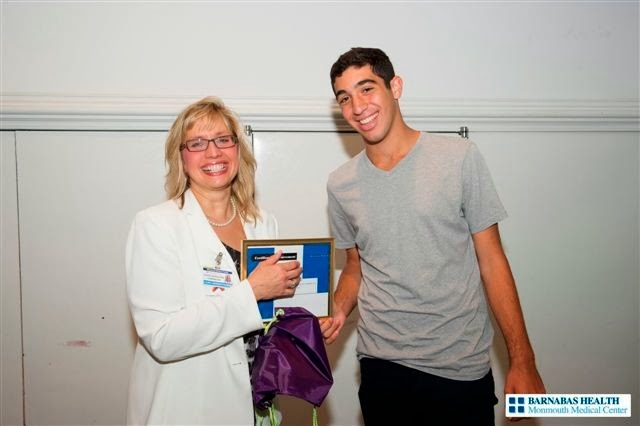 This past summer I had the opportunity to intern at Monmouth Medical Center for five weeks alongside other Flatbush students including Eli Cattan, Isaac Mizrahi, Julie Mizrahi, Ralph Navarro and Michael Tawil, through the Yeshivah of Flatbush Pathfinders Program. I also volunteered at the hospital making patient care rounds where I visited patients and attended to their needs as much as possible to make their stay more comfortable. These patients were generally recovering from various surgeries and it gave me great pleasure in knowing that I am helping them recover in a small way. They constantly told me how much they appreciated me being there and visiting them. We all want to improve this planet, make it a healthier, safer environment. We recycle plastic to make a more eko friendly water bottle, we recycle paper to make a more eko friendly shopping bag. June of last year, Nike Reuse-a-Shoe started a program for recycling sneakers to put them to good use. The worn out athletic shoes get ground down into a scrap material called Nike Grind. With this material Nike is able to transform the Nike Grind scrap into high- quality sports surfaces such as courts, tracks, fields and more. The best part is, the Yeshivah of Flatbush was able to help. On Monday, September 9, 2013, the first day the Yeshivah of Flatbush resumed their sessions, the Eko Commission wasted no time in preparing for the sneaker drive. After spending much of August planning, everyone was so excited to start. Thrilled to pitch in, we had members of the commission go around to classrooms, send out texts, announce it on the loudspeaker, notifying anyone and everyone about this exciting event. Before we knew it, we were receiving sneakers left and right, whether from eager students or enthusiastic members of the administration. The sneaker drive lasted until Tuesday, September 17. It was then that the Eko Commission discovered that the students and staff at YOFHS accumulated up to 70 pairs of sneakers! That's a lot of Nike Grind! Nike was very grateful for our tremendous contribution. With our help, Nike will be able to create a whole new field or track that will be made from 100% recycled material. So next time you step onto the court or the field, just think — you can better our Earth, one shoe at a time. I had the experience of volunteering in a fashion show during New York Fashion Week alongside other Flatbush students. We had the opportunity to help set up Douglas Hannant's runway at the fashion show. We got to help organize everything before the show. It was an amazing experience to see what goes on back stage in the real world. In the end we all watched it come together. The fashion show was beautiful, Hannant did a great job. It was so great knowing that we were a part of it! We explored our interest in fashion up-close and personal in a real world setting. We owe a big thank you to Mrs. Hanon for giving us this opportunity through the Pathfinders Program!